61 Philorth Avenue is a traditional stone and slate mid-terraced dwellinghouse, which has been successfully extended in the past to provide a spacious third bedroom within the attic space. A viewing of this property is highly recommended to fully appreciate the scale of accommodation and the high level of presentation throughout. 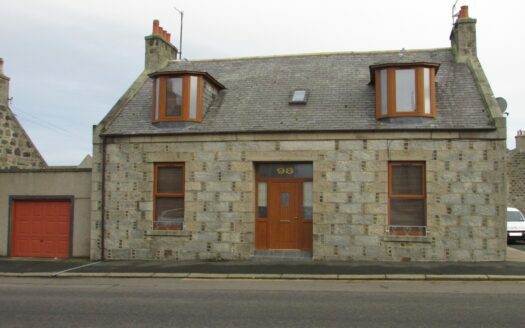 The property comprises the following:- entrance vestibule, spacious sitting room, with bay window to front, modern fitted kitchen to include a range of built-in appliances. Upstairs there are two double sized bedrooms along with recently fitted bathroom. A fitted staircase from the landing leads up to Bedroom 3 within the attic space. There is a fully enclosed rear garden which is easily maintained and presented with decking and astroturf type grass. Garden shed. A loc-bloc driveway provides off-street parking for up to two vehicles. A new gas combi boiler was installed during 2017.